Welcome back to your Monday morning installment of Orbit Cover Launch. This week I’m very excited to launch the cover of a brand-new book by science fiction great Greg Bear. 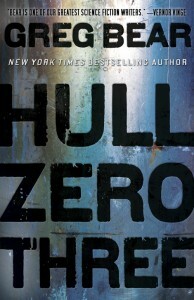 Orbit is really excited to start publishing Greg Bear and we’re even more excited about starting with Hull Zero Three. It’s a fast-paced space thriller and a real page-turner. It’s definitely of the ilk of Aliens and Event Horizon, and I could totally picture it as a film as I was reading. It’s also a great place to start if you’ve never read Greg Bear before. This cover was a little tough because although it does happen in space we didn’t want to give it that space opera kind of feel – it’s smart, but also much more immediate and suspenseful than operatic. It’s a much more in your face page-turning thriller, so I kind of tried to design a hybrid of scifi and big thriller book. The texture is SO much better in person, but for now you’ll have to make due with just a screen image. A starship hurtles through the emptiness of space. Its destination—unknown. Its purpose—a mystery. Its history—lost. Now, one man wakes up. Ripped from a dream of a new home—a new planet and the woman he was meant to love in his arms—he finds himself, wet, naked, and freezing to death. The dark halls are full of monsters but trusting other survivors he meets might be the greater danger. All he has are questions—Who is he? Where are they going? What happened to the dream of a new life? What happened to the woman he loved. What happened to Hull 03? All will be answered, if he can survive. Uncover the mystery. Fix the ship. Find a way home. 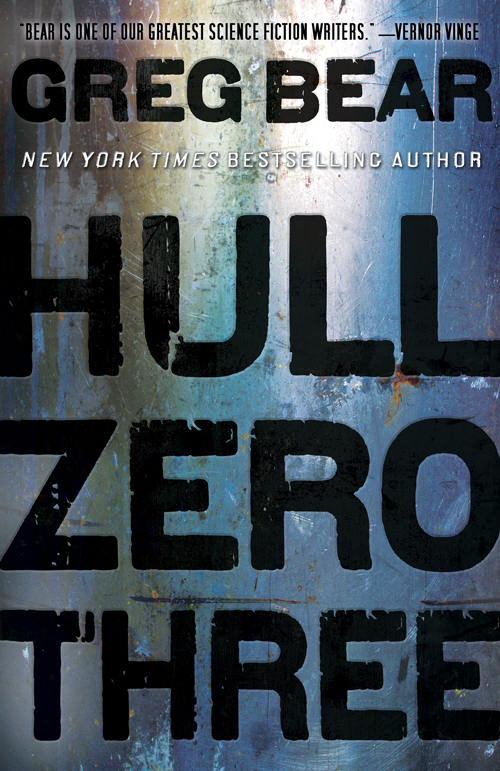 HULL ZERO THREE is an edge of your seat thrill ride through the darkest reaches of space.